What's the BIG IDEA you have? 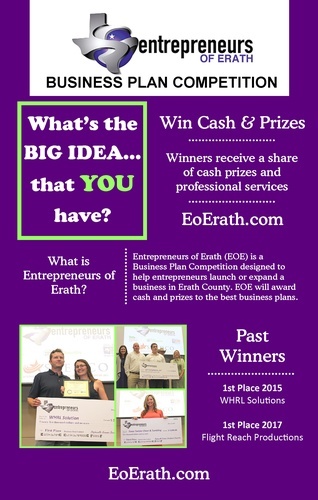 ​The top finalist companies in the competition will receive cash prizes. 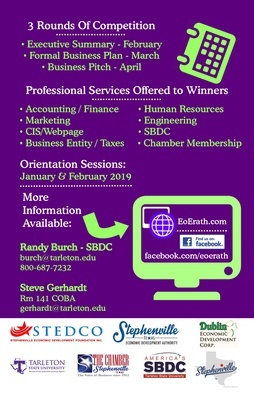 In addition, in-kind prizes comprised of professional services will be awarded to the top three participants in the areas of marketing, accounting, web design, legal, human resource, engineering, and a Stephenville Chamber of Commerce membership. Several training opportunities are available for participants to work with experts from the TSU Small Business Development Center. Orientation sessions will familiarize participants with each phase of the competition. Additional sessions will be held to assist participants with writing a business plan.